2015 Louis Antoine Luyt, Pipeno, Pais, Coelemu, Chile. The fresh and fun Pipeno Pais line from Louis Antoine Luyt are from some of the oldest vines still producing wine grapes in the world and are certainly the most affordable piece of history you can drink! The Pais grape is known as the Mission Grape or Listan Prieto, it was carried to the new world by the Spanish Missionaries in the later half of the 16th century, and Luyt’s Pipeno wines come from areas around those original Mission sites, which are set on 300 million year old soils similar to Morgon and Cote de Brouilly in Beaujolais with iron rich layers and granite schist. Luyt’s Pipeno Pais Coelemu is delightfully bright and earthy with dark berries, spice and an almost tart/herbal vermouth note, light in tannin and medium bodied making for a great food wine and easy like a Beaujolais, it is make in an ancient and traditional way, all natural, so it isn’t overly polished and you get an honest and interesting wine. 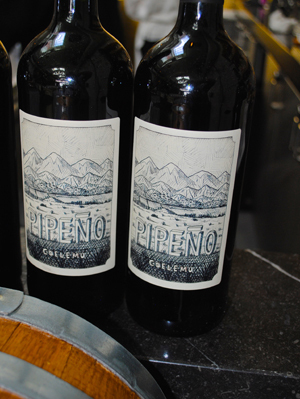 This lively 2015 Pipeno Coelemu starts with sour cherry, raspberry, minty herb, plum and red pepper spice along with zesty red peach, dried orange rind and truffle notes, this red will settle some in bottle and get a bit fuller on the palate with short term aging, but it is seriously all about enjoyable quaffing and is great for picnic, BBQ and parties, especially for the adventurous! Drink ex-Lapierre winemaker, of Morgon in Beaujolais, Frenchman Louis Antoine Luyt’s vibrant Pipeno red over the next year or so, it is like drinking history, especially when you realize the vines are close to 300 years old!